…he has known how to become a varied, original, fecund, and often very powerful painter. He has a gift for great pompous theatrical schemes. He knows how to put sentiment and thought into his religious scenes; he even impregnates them with an accent of faith which bring to them a touch of passion. He paints ceilings broadly combining in them artistic impression with the severe laws of aerial perspective. He is, also after all, full of auspicious talents. Désiré-François Laugée was a diverse artist showing propensities toward themes ranging from social scenes of gleaners to religious depictions including several important commissions for churches. In 1840…Art was in a period of complete Renaissance, as much in genre, landscape as in history painting.…a new art rose up, more alive, more moving, more human than that which preceeded it. Meanwhile, victory seemed still undecided. The classicists hotly defended their terrain step by step, while the romanticists, all young, ardent, passionate, implanted themselves more each day and won victories which frightened, without however disarming, the devotees of the academic traditions. Mr. Laugée thus found himself between the two camps, undecided, anxious, passionate about new theories, and at the same time worried about the future which was reserved for them. This unstable situation influenced his choice of themes – he never confined himself to one genre but instead varied his choices throughout his career. Early on he executed historical painting in the grand manner of the École tradition, evidenced by his early Salon entries. He debuted at the Salon of 1845 with a portrait of a father and son, M.G.L. and M.D.L., mentioned in some writings to be that of his father. That his first Salon entries were portraits shows that even before he began his public career he was gaining commissions because of his budding talent. By this time he was just barely twenty-two years old, having spent five years studying at the École des Beaux-Arts, perfecting composition and execution. Laugée regularly submitted portraits to the Salon until around 1859. During this time he also began working on more diverse themes, such as religious and historical subjects, recalling his teacher Picot who was well-known for his religious and historical compositions. Examples of Laugée’s entries include La Mort de Zurbaran (The Death of Zurbaran), 1850; Siège de Saint-Quentin (Siege of Saint-Quentin), 1852; Sainte Elisabeth de France (Saint Elizabeth of France), 1857; among others. As time passed Laugée began to look towards nat ure to expand his horizons. Historically, landscape painting was on the lower ranks of the hierarchy of painting, according to the École des Beaux-Arts and Salon principles, and it often relied on historical or mythologized renderings of landscape, devoid of the personal identification with nature that characterized many landscape painters of this period. These incoming landscape painters began to challenge this assumption and paved the way for the advancement of landscape painting based on contemporary French scenes. In addition, Laugée’s interest in landscape painting must have also coincided with his works showing peasant scenes. These peasant scenes did not consume his work at the Salon but they did suggest a strong social element in his oeuvre and became a theme for which he became exceedingly well known. Peasant scenes had recently become very popular with many artists, such as Jules Breton and François Millet, who began to record aspects of traditions of daily life in the country, many of which were slowly coming to an end with the move towards industrialization. Laugée’s images of peasants offer a more nostalgic quality than those of his contemporaries and were continued by his students, among them - Julien Dupré. While his peasant scenes make up an important part of his oeuvre, Laugée concentrated most heavily on religious scenes for the majority of his Salon career. Many of these were purchased by the state, such as his 1863 Salon exhibit of Saint Louis Lavant les Pieds aux Pauvres (Saint Louis Washing the Feet of the Poor) or were based on works commissioned by churches. Laugée was also commissioned for a number of decorative works, very coveted commissions during the period including works in the chapel of the Virgin in the church of Saint Pierre du Gros Caillou; the chapel of St. Peter and St. Paul in the basilica of Saint-Quentin; the chapel of St. Clotilde in the church of St. Clotilde; the chapel of St. Dénis in La Trinité. Laugée had become a painter in high demand with his brand of historical and religious painting, but it should also be remembered that he was a more diverse artist aware of the social issues of the period. He was honored many times with accolades, including Salon medals at 1851, 1855, and 1861, for La Mort de Zurbaran – third class (The Death of Zurbaran); several works at the Salon of 1855 including Mort de Guillaume le Conquérant – second class (Death of Guillaume the Conquerer); and several works at the Salon of 1861, including La Récolte des Oeillettes, Picardie (Poppy Harvest, Picardy). He was also honored with the Chevalier de la Légion d’Honneur in 1865 and by the end of his career was a member of the Société des Artistes Français and “hors concours”, or exempt from having to submit his work for jury acceptance. He died on January 24th, 1896. 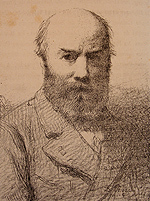 Désiré-François Laugée had a son, Georges Laugée, who continued the family tradition of painting. He studied under his father, and also exhibited alongside him on many occasions. Désiré was also the teacher to Julien Dupré who attended classes in his academic studio, and who was one of the leading exponents of the second generation of Realist painters. Through his numerous Salon showings, public and private commissions, and establishment of his own atelier, Laugée secured his position in the history of academic painting and influenced the work of the next generation of French artists.